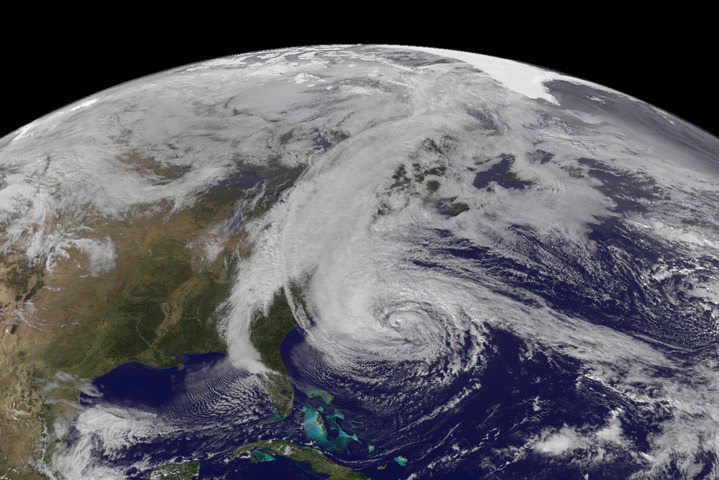 For all that, we can thank computers, planes, satellites and probes – the sophisticated tools of hurricane forecasting. From the start of the season to the last storm’s final gusts, scientists predict and track these spinning behemoths with ever-greater skill and precision as forecasting technology improves and forecasters concoct new ways to deploy it. “I think we are in the midst of a kind of revolution,” says Sundararaman Gopalakrishnan, a hurricane researcher at the National Oceanic and Atmospheric Administration. 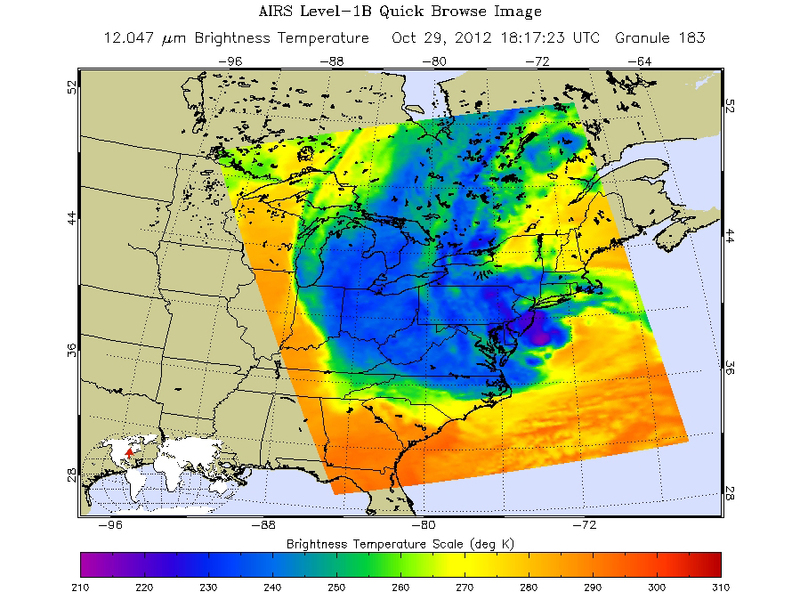 Sandy let forecasters demonstrate this new technology with stunningly detailed infrared, satellite, and radar images and on-the-mark predictions – the National Hurricane Center nailed Sandy’s landfall in New Jersey four days in advance. But researchers like Gopalakrishnan still aren’t satisfied; they’re busy developing the tools and techniques to make hurricane forecasting even better. Hurricane prediction begins with six-month forecasts that estimate how active a season will be. Most organizations (such as NOAA or the Weather Channel) issue predictions at the beginning of June to last through November. These organizations develop predictions by plugging sea surface temperature data collected by NOAA into computer models, along with varying conditions like temperature and humidity. One such organization, the Florida State University Center for Ocean-Atmospheric Prediction Studies, creates a series of simulations based on the data, and then averages them to produce a forecast. Accuracy is improving, though there is so much uncertainty that long-term predictions still often miss the mark. “It’s not often that you are able to get a perfect forecast,” admits Tim LaRow, a meteorologist at the center. For example, the center’s model predicted five to nine hurricanes in 2012; instead, there were an above average 10. Though it remains difficult to pinpoint the number of hurricanes that will occur in a season, predictions for the track and intensity of individual storms are improving. The timeliness of these forecasts has progressed rapidly because new computer models are running with unprecedented speed, according to NOAA’s Gopalakrishnan. In past years, “it would have taken days to run these models.” Now, many forecasts are produced in as few as 84 minutes. Data collection is improving too. Sporting groundbreaking optics, satellites hovering above the earth’s atmosphere take snapshots of a hurricane as it moves across the ocean, providing a broad picture of its size and track. When we imagine satellite images of hurricanes, most of us picture a white swirl floating over mottled green land and navy blue waters. Today’s satellites, however, also take infrared images that detect minute variations in the area around a storm and create a three-dimensional picture of moisture and temperature, which increase hurricane intensity, explains Jason Dunion, a satellite imagery specialist at NOAA. Dunion hopes infrared imaging will improve future forecasts by observing two phenomena difficult to see with visible-light imagery. The first are dust storms, which migrate west from the Sahara Desert and can suppress developing hurricanes. The second is the daily “exhale” of hurricanes that tends to occur as temperatures drop after sunset and the storms spread out and lose some strength. What conventional and infrared satellite photos cannot do, however, is look inside the hurricane. For that forecasters use radar, which sends pulses of energy into the storm and calculates distance based on how long those pulses take to “echo” back. Radar allows meteorologists to “peer through the rain in clouds that are between you and the ocean,” Dunion says. Hans Graber, a hurricane expert at the University of Miami, is working on improved sensors for satellites equipped with radar transmitters. Radar, he says, lets scientists measure the foam and turbulence a storm drums up on the ocean’s surface, which are indicators of wind speed and direction. Satellite radar also gauges how large the eye of the storm is, and whether the eyewall—the ring of clouds surrounding the eye where the winds are fiercest—is strengthening. The sensors Graber is developing rely on synthetic aperture radar, a form of radar that produces ultra high-resolution data. Even the newest radars and satellite imagery, however, haven’t eliminated the need to collect more detailed data from directly inside hurricanes. Enter the hurricane hunter, an aircraft that flies into a storm as it crosses the ocean. Hurricane hunters deploy radar to create maps of the internal wind patterns that help forecasters determine how intense a storm will be. They also release dropsondes, instruments NOAA’s Dunion describes as “mini weather stations on parachutes.” The probes, dropped from 45,000 feet above the sea surface, transmit data on pressure, humidity, temperature, and wind speed every 15 feet. Hurricane hunters have a pilot and crew, but NOAA increasingly relies on remotely controlled drones to fly in conditions too dangerous for manned planes. So far, the only pilotless aircraft meteorologists have used to explore inside hurricanes are aerosondes, tiny drones with a nine-foot wingspan and little room for measurement instruments. 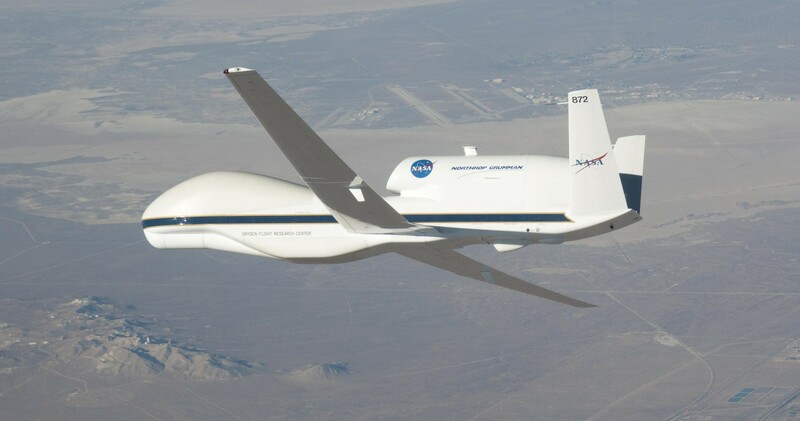 But in 2013, NASA will begin sending its Global Hawk aircraft, with a 120-foot wingspan, onboard radar, and automatically launched dropsondes, into the center of hurricanes. The Global Hawk is also able to fly for nearly 24 hours — far longer than manned hurricane hunters. Satellites and hurricane hunters provide a wealth of information as a hurricane forms and moves over the sea, but a forecaster’s job doesn’t end when a storm makes landfall. As a hurricane moves over land, its winds encounter a rougher landscape than the water over which it formed. The storm slows but becomes more turbulent, producing stronger short gusts, says Brian Hirth, a member of the Texas Tech University Hurricane Research Team in Lubbock. Hirth and his team collect data on hurricanes as the storms come ashore. Their instruments include radar transmitters mounted on truck beds and “Stick-Net” probes, which are eight-foot tripods with bright yellow legs topped by boxes that measure the same conditions as dropsonde parachutes. Placed on high ground, the truck-mounted radar transmitters monitor how winds change after landfall. An operator in the truck mans the dish throughout the storm. The Stick-Net probes, by contrast, are left behind along the coastline as the team takes shelter elsewhere. The probes have come a long way from the unwieldy t trailer-mounted towers, each more than 30 feet tall, that the Texas team used to operate. After the devastation of Hurricanes Katrina and Rita in 2005, Hirth says, the team realized it needed cheaper, more plentiful probes to understand how hurricane winds vary in different locations. The Stick-Net probes have kept evolving since then. They now cost about $10,000, a tenth of the price of the trailer-mounted towers. 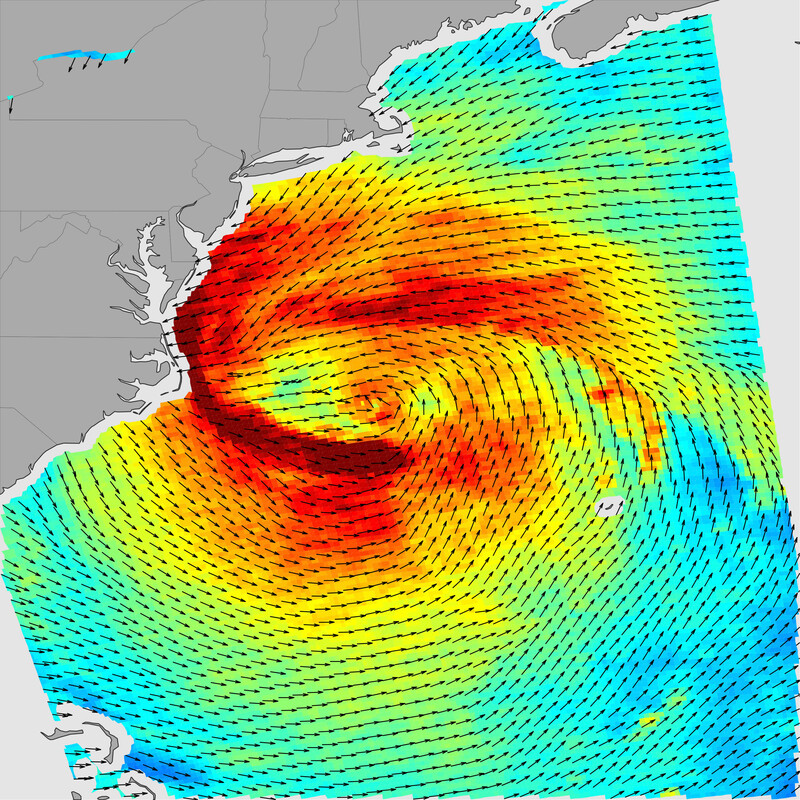 This year, half of the 24-probe fleet has been upgraded to broadcast in real-time, letting Hirth and his team analyze data from Hurricane Sandy even as the storm continued to rage. The probes have been so useful that Hirth hopes to eventually double their fleet and “litter the coastline” the next time a major storm comes ashore. So next hurricane season, if you find yourself in the path of an approaching storm, scan the skies for a Global Hawk heading into the fray and look for a phalanx of Stick-Net probes along the shoreline. And then get to safe place as quickly as you can because, as Hurricane Sandy proved, even the most sophisticated forecasts cannot stop a storm from wreaking havoc when it finally hits. Kate Baggaley is a recent graduate of Vassar College, where she received a B.A. in Biology and a minor in English. She spent most of her undergraduate years thinking she wanted to be a research scientist, and bounced around field stations in Mexico and the Isles of Shoals until she realized that her favorite part of science is writing about it. She loves to write about ecology, evolution and animal behavior, especially when birds are involved. Follow her on Twitter @kate_baggaley.